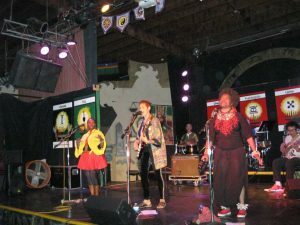 Diario Judío México - The Peace Train is coming and we can all get high on the Peace Train as Sharon Katz has brought her band to San Diego and Tijuana, starting with last night’s rousing performance at Makeda Makossa’s World Beat Center. It was so inspiring to see women of various ages and ethnicities all rocking out together. Sharon Katz, Nonhlanda Wanda, and Wendy Quick sang and danced with youthful vigor. The concert was to commemorate Nelson Mandela’s 100th birthday and he would have been proud. In 1992, when the barriers of Apartheid were beginning to come down, a South African Jew, Sharon Katz, teamed up with a Zulu woman, Nonhlanhla Wanda to form a musical and lifelong alliance. The music therapist and the educator wanted to help break down the barriers in the country and when Nelson Mandela was released from prison, they embarked on a journey together across the nation, riding an actual train called, the Peace Train with a 500 voice multiracial choir. They became Mandela’s face of the new nation. Today, that tradition continues this time with Mexico. On Saturday, July 21st, there will be the Peace Train Transcending Barriers concert at the Centro Cultural Tijuana [CECUT]. The concert will be with various children’s choirs from Mexico. The concert is scheduled from 6:00 to 9:00 in the evening. However, it is an all day event open to the public on both sides. Working together with Promotora de Bellas Artes executive director, Alida Guajardo de Cervantes, the band has several fun things planned, including a rehearsal and cultural activities before the evening’s performance at CECUT. Participants can join in by meeting at the World Beat Center at 9:00 AM or the McDonald’s in San Ysidro at noon. There will be buses to bring everyone home after the concert. On Friday, July 20th at 7:00 pm, there will be a screening of the film, “When Voices Meet”, at the World Beat Center in Balboa Park. This award winning film is about the history and long term impact of the Peace Train to help end Apartheid and spread Nelson Mandela’s vision. As Linda-Anne Kahn – a South African transplant who lives in San Diego- says, “My cousin, Sharon, stands for peace, love, and bringing everyone together”, an appropriate message in these divisive times.